This illustration is best viewed in landscape mode. Abbott, E.A. (1952). Flatland: A romance in many dimensions (6th ed.). New York, NY: Dover. (Original work published in 1884). George Saliba, Islamic Science and the Making of the European Renaissance. London, UK and Cambridge, MA: MIT Press, 2007. Kuhn, T. (1957). The Copernican Revolution. Cambridge, MA: Harvard University Press. Yarbus, A. L. (1967). Eye movements and vision (B. Haigh, Trans.). New York, NY: Plenum Press. Nick Sousanis is a postdoctoral fellow in Comics Studies at the University of Calgary. 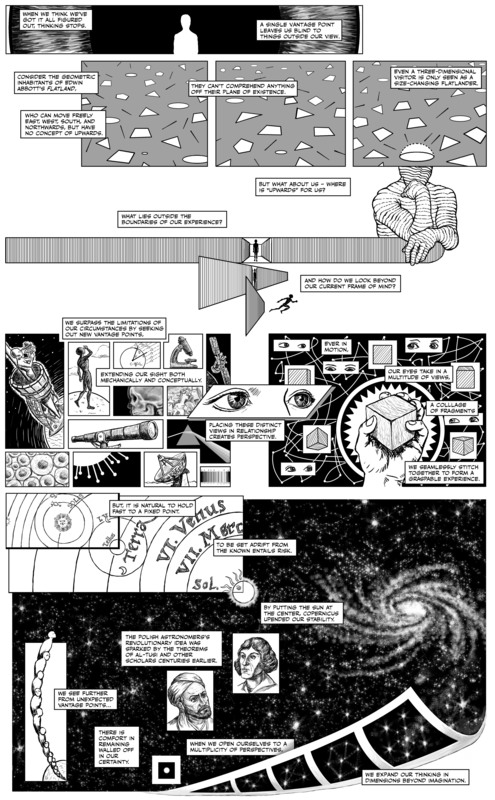 His graphic novel “Unflattening” was published in March. Follow him on Twitter @nsousanis.